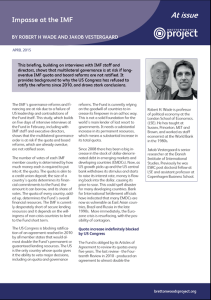 This briefing, building on interviews with IMF staff and directors, shows that multilateral governance is at risk if long-overdue IMF quota and board reforms are not ratified. It provides background to why the US Congress has refused to ratify the reforms since 2010, and draws stark conclusions. The IMF’s governance reforms and financing are at risk due to a failure of US leadership and contradictions of the Fund itself. This study, which builds on five days of intensive interviews at the Fund in February, including with IMF staff and executive directors, shows that the multilateral governance order is at risk if the quota and board reforms, which are already overdue, are not ratified soon. The number of votes of each IMF member country is determined by how much money each is required to put into it: the quota. The quota is akin to a credit union deposit; the size of a country’s quota determines its financial commitments to the Fund, the amount it can borrow, and its share of votes. The quota of every country, added up, determines the Fund’s overall financial resources. The IMF is currently desperately short of secure lending resources and it depends on the willingness of non-crisis countries to lend to the Fund short term. The Fund is currently relying on the goodwill of countries to increase its firepower in an ad hoc way. This is not a solid foundation for the world’s main lender of last resort to governments. 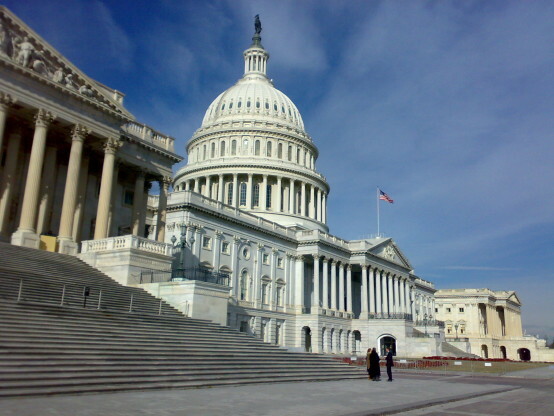 The US Congress is blocking ratification of an agreement reached in 2010 by all member states that would almost double the Fund’s permanent or guaranteed lending resources. The US is the only country whose quota gives it the ability to veto major decisions, including on quota and governance reforms. The Fund is currently relying on the goodwill of countries to increase its firepower in an ad hoc way. This is not a solid foundation for the world’s main lender of last resort to governments. It needs a substantial increase in its permanent resources, which means a substantial increase in its total quota. Since 2008 there has been a big increase in the stock of dollar-denominated debt in emerging markets and developing countries (EMDCs). Now, as US growth picks up and the US central bank withdraws its stimulus and starts to raise its interest rate, money is flowing back into the dollar, causing its price to soar. This could spell disaster for many developing countries. Bank for International Settlement officials have indicated that many EMDCs are now as vulnerable as East Asian countries, Brazil and Russia in the late 1990s. More immediately, the Eurozone crisis is resurfacing, with the possibility of contagion. The Fund is obliged by its Articles of Agreement to review its quotas every five years. The last review – the Fourteenth Review in 2010 – produced an agreement to almost double the Fund’s quota, which would constitute a substantial strengthening of the multilateral safety net system. The 2010 agreement also included some redistribution of quota shares away from the current concentration in the hands of advanced economies – whereby France and Germany hold a combined share of 10 per cent compared with the combined share of China and Brazil of a little more than 5 per cent. But since 2010, the US Congress has declined to approve what the US executive branch agreed to. Part of the reason is that the Republicans do not wish to approve anything the Obama administration wants them to. Another is that most Republicans are hostile to the Fund, seeing it as a vaguely socialist institution which protects governments from holy market discipline by “bailing them out” in the event of a crisis. Further, the additional Fund resources would currently mainly assist European countries, and Congress asks why should US taxpayers’ money be used to help Europeans. This criticism is also voiced by many EMDCs, upset at what they see as European states’ use of their excessive voting power and IMF board representation, thanks to their unreformed quota allowance, to lend to other European states on an unprecedented scale. The situation is complicated by the fact that the 2010 agreement included two different components. One was the quota increase and redistribution. The other was a change in the composition of the board of executive directors. The Articles of Agreement say that the top five shareholders shall “appoint” their executive directors, while the other 19 executive directors are “elected”. Appointed executive directors can represent only their own country; elected ones can – and most do – represent more than one country. The 2010 agreement called for the appointed chairs (US, Japan, UK, Germany and France) to be converted into elected chairs. This would facilitate the long-standing US and EMDC objective of reducing the number of chairs held by western European countries (which are seen as overrepresented, with eight to nine, of the 24 chairs effectively controlled by western European states). The proposed change would also increase the number of chairs held by EMDCs, ensuring that representation at the board of executive directors better reflects the present distribution of economic weight between countries. However, this change to an all-elected board requires change in the Articles of Agreement, and change in the Articles requires approval from shareholders holding at least 85 per cent of the total quota. The US vote share is more than 15 per cent, which gives it, either the administration or Congress, veto power on any decisions requiring an 85 per cent majority. It is the only state with a veto. The US insisted in 2010 that the two components – the quota increase (which does not require an 85 per cent majority) and the board reform – be legally linked, making the quota increase also hostage to the US veto. The US insisted on the link because if the quota increase went into effect before the US had ratified it (in which case the US quota would not increase), the US share of the new much higher total quota would fall and the US would lose its veto. This would be unacceptable; therefore the quota increase must not go ahead until Congress approved the board reform. Also, the US insisted on the link to keep the Europeans on the hook: if the Europeans dragged their heels on giving up two chairs, the US could hit back by vetoing the quota increase. Can the two reforms be de-linked? The IMF has prepared an “options” paper to explore how governance reforms can progress without congressional approval of the October 2010 package. The paper is top secret (it exists only in a small number of numbered copies), and clearly surrounded by competing interests and unresolved tensions. The IMF executive board issued a public statement in January urging its own board of governors to adopt a resolution that would reiterate the need to resolve the problem, but without offering any solutions. The one solution that would serve the interests of almost everyone is to de-link the two components of the 2010 agreement, so that the quota increase would go into effect independently of the change in board composition. The board could assure the US that no issue would be brought to the board which required an 85 per cent majority during the period when its quota fell below 15 per cent – so that it would continue to have a de facto though not de jure veto (until the Congress agreed to raise the US quota by enough to restore it to more than 15 per cent of the total). However, such a delinking would require a board resolution, and a board resolution requires an 85 per cent majority; so again is hostage to a US veto. Many executive directors and IMF staff told us that the US will never agree to give up its de jure veto and trust to a gentlemen’s agreement, especially when the BRICS (Brazil, Russia, India, China, South Africa) have almost 15 per cent of the total quota between themselves. Any US administration seen to give up its de jure veto, and lose American influence, would open itself to considerable domestic criticism. But the US administration and the US executive director have remained silent on the delinking issue, leaving it to executive directors and IMF staff to articulate the likely US refusal. They do not want to say anything that might jeopardise their difficult negotiations with Congress about ratifying the 2010 agreement, which is merely one of many issues on which the administration is trying to cut deals with Congress. Given that the IMF has zero salience in US domestic politics, congressmen and women can extract a high price from the Treasury in return for their support on the IMF. However, senior officials are now seriously embarrassed in international forums (such as the G20) when they are admonished to shoulder their collective responsibilities by China, Russia, Brazil, India and others, rather than the other way around, as has long been the norm. The officials have to balance the US’ loss of leadership legitimacy against the high budgetary price of gettting the Congress to approve the 2010 agreement. When will the embarrassment and loss of legitimacy outweigh the cost of approval extracted by Congress? It is anyone’s guess. The bottom line is that any route to doubling the secure resources of the Fund – whether through ratification of the 2010 agreement or by delinking its two constitutive components –requires consensus across bipartisan lines in the US Congress, which seems unlikely in the foreseeable future. As if this were not enough, the Fund must finalise the Fifteenth Quota Review by the end of 2015 (according to the five year rule set out in the Articles of Agreement). But where does it start from, given that the Fourteenth Review has not been put into effect? The answer is entirely unclear. The situation is complicated further by the fact that the Fund is meant to be negotiating changes to the quota formula by which countries’ quota shares are calculated. Given the context, this is an intensely political, rather than technical, question. There are fierce differences within the executive board on how (if at all) the formula should be changed. Broadly speaking, the countries with large GDPs say the formula should give “share of global GDP” much more weight than at present (currently 50 per cent weighting in the formula). Countries with relatively small GDPs say that moving to GDP shares would make the board look as unrepresentative as the G20 and that “economic openness” (as indicated by the share of trade in GDP) should continue to receive substantial weight (at present 30 per cent weighting), among other reasons because the very rationale of the Fund is to protect the openness of the world economy. The issues of how to proceed with governance reforms, including the stalled Fourteenth and Fifteenth Reviews and the quota formula, will be the subject of heated formal and informal debate at the IMF spring meetings in April. But it will be a miracle if agreement is reached by December, as required by the Articles. An extension beyond December would require a board Resolution (which requires an 85 per cent majority). If the BRICS and allies decide not to agree to an extension beyond December they could block the extension, creating a constitutional crisis. But the BRICS are being cautious in pressing their case, always balancing their pressure for more representation against the need to keep the Fund effective and credible. The same applies to another main weapon in the hands of the BRICS and other EMDCs: the threat to discontinue participation in the Fund’s New Arrangements to Borrow, whereby countries lend to the Fund to preserve its short-term resources needed while quota reform remains unresolved. Will the US give up its veto to enable reform? The Fund is trapped by its history. The US veto, inscribed into the Fund at the very beginning, is damaging the organisation and its ability to play its role. Even if the US Congress agrees to ratify the 2010 agreement and even if the Fifteenth Review is completed, the fundamental problem of the US veto remains. Without changes in the supermajority rules, China may have a veto in twenty years’ time, and the US may have lost so much relative economic weight as to lose its veto. This scenario might be enough to induce the US to give up its veto to prevent any one country having a veto. Without this change, the danger is that the stability of the world economy depends on ad hoc and short-term increases in the Fund’s resources and on a spaghetti ball of bilateral or regional safety net agreements, some of them out of sight beneath the table, their aggregate stabilising effects unknown when another multi-country crises comes. That is a prospect to avoid. The “elephant in the room”, the US veto, should no longer be avoided.